For the most part, the bye weeks are over. This week is one of the most crucial weekends, as this probably marks the time that teams begin to clinch playoff spots. Now that your team will probably be at full-strength, it's time to move away from high floor guys and focus on high ceiling guys who could win your league for you. Hopefully, unless somebody suffered an injury, your team is filled and ready to win. Let's take a look at some possible league-winners. All these players are owned in under 40% of Yahoo! leagues. With a few exceptions, players from previous weeks will not appear. Marqise Lee (39% owned) - Marqise Lee hasn't really had the ideal year, but he's done pretty well. He's got 49, 83, 72, and 75 yards receiving in Jacksonville's last 4 games. Pretty good. Lee just caught his first touchdown of the year Sunday so hopefully that's a sign of things to come. Lee's the clear WR1 on a team that can surprise you in the passing attack, meaning he returns top-30 value almost every week. The Chargers are a tough matchup, but games against Cleveland, Indianapolis, and Houston aren't too far away. Josh McCown (35% owned) - If it ain't broke, don't fix it. Josh McCown makes his second appearance on the waiver wire article in as many weeks, meaning people still aren't taking advantage of his numbers. McCown has the fourth most points of any quarterback over the past 5 weeks, and faces a Tampa Bay defense this week allowing the 7th most points to opposing QB's. Need I say more? Josh Gordon (35% owned) - What did I say about upside? Josh Gordon was exactly who I described above. Especially now, you could drop your QB or TE's backup to pick up Gordon. He's eligible to return Week 13 and met with team officials today at the facility. People forget that he had back-to-back 200 yard games back in 2013. We've seen flashes of DeShone Kizer being really good, so there's always a possibility Gordon improves on what he did back in 2013. If he did, it would be legendary and I don't want to miss out on the fun. Pick him up! Damien Williams (33% owned) - In the first week without Jay Ajayi , both Damien Williams and Kenyan Drake did well. They both had at least 60 yards with Drake totaling 104. However, he lost a fumble. Williams had a strong second effort on a touchdown catch Sunday night against Oakland. Miami would be smart to mask Jay Cutler behind their two backs. Oakland's run defense isn't exactly good, but they still got a fair amount of carries. I'd say Williams is the guy to start Week 10. 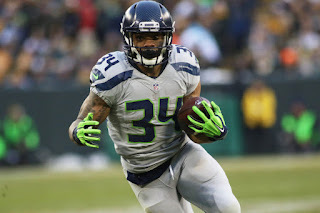 Thomas Rawls (13% owned) - Seattle tried to get Eddie Lacy going Sunday, but it just didn't work. He ended up leaving the game and is injured. Despite having one of the league's best quarterbacks in Russell Wilson, Seattle is committed to the run game. When Rawls took over, he did pretty well, touching the ball 11 times for 70 yards. On a short week, it doesn't appear that Eddie Lacy or CJ Prosise will be ready for the game. Rawls is a top-24 option this week and could start to produce consistently with games against Atlanta and San Francisco in the near future. Marquise Goodwin (12% owned) - The 49ers have to throw the ball to somebody, I think. Carlos Hyde probably can't catch every single pass even if that feels like what he's doing. Pierre Garcon is out for the year with a neck injury and slot WR Trent Taylor could be out multiple weeks, leaving Goodwin as the WR1 for the team. He's really fast, which could mean huge fantasy production some weeks. San Francisco plays the Giants this week, who got absolutely torched by Jared Goff and allowed a 67 yard touchdown pass to Sammy Watkins. Garcon was able to build value off of being the lone weapon, so let's hope Goodwin can do the same. New England Patriots (39% owned) - The Patriots still don't have a very good defense, but they've shored things up recently, allowing under 20 points in 4 straight games. They're also coming off of a bye, and I can't imagine Coach Belichick and the staff didn't take some serious time to fix the unit. Also, they play Denver. Brock Osweiler is currently the man at the helm of that offense, which isn't a good thing. I don't know why, but he is. I'm going to make a not-too-bold prediction here and say Denver's offense doesn't do much and the Pats generate a turnover or two.